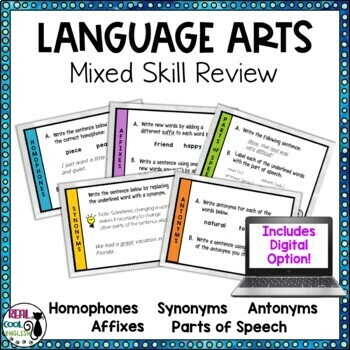 Review multiple skills with this set of task cards to give your students lots of practice with synonyms, antonyms, homophones, affixes (prefixes and suffixes), and parts of speech. These can be used in group activities or individually, and are great for bell ringers/class warm ups, or for periodic review of concepts (especially after a break). They also work well with ESL students. 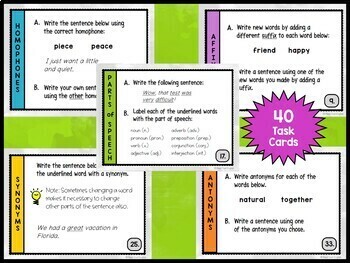 Set of 40 task cards: (8 of each: synonyms, antonyms, homophones, affixes, and parts of speech). Each card has one or two tasks for the specified topic. For example, they may be given a pair of homophones and asked to complete a sentence with the correct homophone, and then write their own sentence using the other. Answer keys with examples of possible answers.